It’s funny. 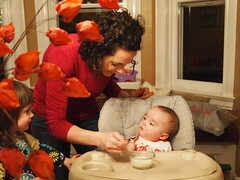 With Sophie I was shocked at how little information the pediatrician gave me regarding solid food. So I read. And researched. And talked to other mothers. I noted when I introduced each food and how long I stuck with that particular one. I paid attention to color, calories, consistency, and whether it was a fruit or vegetable. I made some (not much) and mostly bought organic. I wiped her mouth after every other bite so as not to stain her bibs. My poor boys are lucky if I remember to give them solid food these days. There is no rhyme or reason as to what I give them. I stuck with rice cereal for about a week and then it was whatever was in the pantry or was easy to mash. So far they’ve had sweet potatoes and pears and bananas and apples and squash. I’m not doing vegetables first or all orange foods first—I’m not even sticking to one food for several days before introducing the next. I rarely take pictures. And I wipe their faces at the very end with a shared washcloth (I’m determined to cut down on laundry as it’s becoming quite ridiculous). 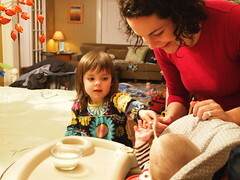 I’m still pumping milk for both of them and on good days, most days, really, they solely get breast milk (although, unfortunately, always out of bottles). Adding solid food to their diet has been fun (they’re growing! they’re getting older! they look so cute smacking their little lips on the tips of Sophie’s old pink and purple spoons!) but I forgot how terribly time consuming it is. 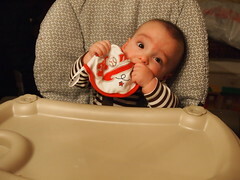 It’s not replacing a bottle feeding as I follow up each solid-food meal with a bottle. Instead, it basically adds a solid hour of work to my day (and more once I add another solid meal in). So I multitask. Sophie sits on my lap and while I spoon feed James, she dips Owen’s spoon into the food of the day and gets it ready for me. 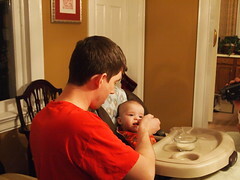 I then give Owen a bite while she takes care of James. And back and forth, back and forth. Or she serenades them with song while they eat. We listen to music on my iPod. Sometimes I manage to sip coffee between dips. And while I try to converse with them, as I believe eating is a highly social event and mealtime conversation an art to love, sometimes I flip through a magazine. It wasn’t so long ago I was in the NICU, feeding James another woman’s milk, from a very small bottle (that was almost as long as him). While feeding him I had to cup his impossibly small body in the palm of my hand and feel him to make sure he continued to breath. The process terrified me. I had to track his breaths by counting them, track time by noting when I started and when I stopped, and keep incredibly careful track of the amount of milk he consumed. He was so small and light and fragile-seeming yet all I wanted him to do was eat and eat and eat so he could come home (and eat he did). This entry was written by kara, posted on January 21, 2011 at 1:05 am, filed under Uncategorized and tagged food, James, Owen. Bookmark the permalink. Follow any comments here with the RSS feed for this post. Post a comment or leave a trackback: Trackback URL.